Just how necessary is the VMT system Oregon is now using on volunteers? 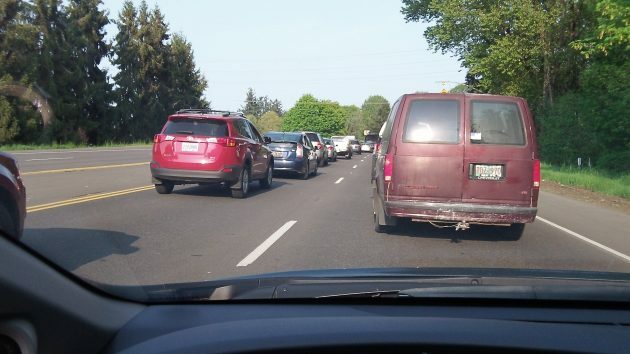 As one of the volunteers paying Oregon’s vehicle mileage tax — in theory anyway — I’m thinking the program is needlessly complicated as long as it applies to vehicles powered by conventional fuel. That’s because of all the record keeping necessary to calculate the tiny difference between the mileage tax and the fuel tax already paid. The main reason we need a mileage tax is that some — a small percentage so far — of motor vehicles don’t use diesel or gas, and a few more have a hybrid propulsion system. So why not apply the VMT or some alternative method only to them? As it is, the legislature authorized a VMT pilot program for all kinds of vehicles. I signed up at the start in July 2015, enrolling a 2007 pickup. I paid gas tax as usual, and a gizmo in the truck reported the daily miles driven to the “OReGO” program, which charged 1.5 cents for each mile the truck moved. After about nine months, I got check for about $20, the difference between the mileage fee and the gas tax I had paid. Then there came the sad day last spring when I traded in my beloved truck. The new one is more efficient. Now the mileage tax accumulates slightly faster than the 30-cent/gallon gas tax charged by the state. On Wednesday, OReGO emailed me an accounting for the six months from April through the end of September. It started with a balance of about $5 left over from the old truck. Since the change, I was charged about $44 in road user fees, while burning 132.7 gallons of gas, on which I paid just under $40 in state tax. So now, my OReGO account manager informs me, my left-over balance has been reduced to $1.18. OReGO sends refunds or bills only for amounts of $20 or more. Still, all this keeping track and calculating minuscule amounts is unnecessary for the fuel tax alone. We pay the tax when we gas up, and that’s it. To pay for the VMT pilot program, the legislature authorized about $5 million in 2013-15 and another $5.8 million in the current biennium, most of it going to outside contractors such as the companies keeping track of mileage driven and amounts to be charged or refunded. ODOT says the road user charge is necessary because fuel efficiency is going up. And in 20 years or so, the government says vehicles are supposed to average 50 mpg, leading to a sharp decline in the amount of gas-tax money collected for roads. But another answer would be to increase the tax in proportion to the rise in fuel efficiency. This would retain the pay-as-you-go simplicity of the system we have. True enough. Who gets to decide how much that will be & when it will occur? The Feds? State? County? City? Combinations? Indexed in any fashion? The purpose of a trial program is to test things out, warts and all. OK they have data now, and will make some official report at some time. Of course, the experiences of a single individual may be different from others. That’s why they want data. I have no problem with other approaches for alternative fuel vehicles. I had one of the first Nissan Leafs, and it wasn’t fair that I did not have to pay for a share of road costs. That needs to be fixed permanently. It is telling that the only solution being pursued is a “tax” imposed by government. Reforming our failed transportation system requires bold, dare I say radical, thinking. It’s out-of-the-box thinking at its finest – a mindset that is foreign to Statists who start from the premise that government knows best. Toll roads for all. Owned & operated by for profit corporations. No thank you, Gordon! Actually, that thinking is not so out-if-the-box. It fits nicely in the Conservative/Republican box. Mr. Shadle’s proposition that American Roads become toll roads is a sound idea. Imagine how many jobs will be created to service the toll-paying motorist. American ingenuity will foster a whole new generation of entrepreneurs who will make toll-paying a pleasant experience, even if you must cross over roads owned by three or four Road Ownership LLC businesses. Plus, the government mints will be striking quarters in record numbers in order for tolls to be paid. One wonders though! Will the DOT allow for predatory monopolistic ownership of massive road mileage, or will small business owners be allowed to enter the Road Ownership Brotherhood. It appears that the author of the original toll road idea may not have thought his plan through. Right on, Gordon! I could start there and go on all night. I won’t. I might even try to read the whole book. Maybe there is a logical intersection, even if small, between libertarianism and my passionate loathing of the American car culture. It never occurred to me. under the Creative Commons Attribution License 3.0″””). Gas tax makes so much more sense. Why should a little commuter car pay the same tax as a big fully loaded truck per mile? Wear on the roads is based on vehicle weight in addition to miles traveled. Gas tax is the best way to fairly charge people for the roads they use, with perhaps a yearly fee on electrics or something along those lines. The gas tax seems a good idea for gas-burning vehicles because of road wear vs weight, as you state, and also because it encourages more efficient (cleaner) vehicles. But, not a fixed (yearly) fee on electrics. The incentives should be to decrease car usage, road wear, and congestion by charging for use, not for merely owning a car. One possible idea for electrics, if you don’t like mileage times weight, is having a separate meter for car charging which combines the utility’s price and the road tax (or only road tax if using solar panels). yeah that sounds more fair than my proposed plan.